Chuck Round Table: "Chuck Versus the Cubic Z"
Nicole Richie + Stone Cold Steve Austin = One awesome edition of Chuck Round Table! Which old friend were you more excited to see? Big Mike, Stone Cold Steve Austin or Nichole Richie? Dr. Toboggan: While I was happy to see all three, I have to go with Big Mike. Especially because his reasoning for coming back was to tell Morgan he intends to make an honest woman out of his mom with a "full, half karat, pear cut, cubic zirconia." 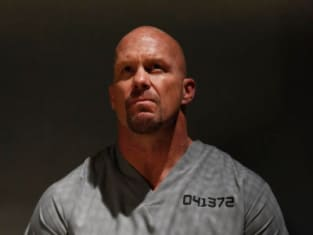 The Barnacle: Definitely Steve Austin for giving Chuck and him the cage fight they deserved. Quiet Pool: Before the episode, it was without a doubt Stone Cold. But after the hour was over, there was not one Stunner, and he didn't crack open four beers at a time and dump them all over himself, missing his mouth completely. So the excitement was lost. Favorite Greta so far: Olivia Munn, Isiah Mustafa or Stacy Kiebler? Dr. Toboggan: I didn't even notice there have been three Gretas so far, so I guess as a default I will go with Stacy because any beautiful Buy More employee who stands up to Steve Austin (even if just for a second) is pretty awesome. Quiet Pool: Super excited for the Summer Glau appearance, as well, but so far it has to be Isaiah Mustafa. The dude can shoot a price tag from long distance and has a winning smile! More unsanitary: Chuck and Sarah agreeing to share a toothbrush or the Castle's air conditioning ducts having vents on the floor of the Buy More? Dr. Toboggan: Definitely the air conditioning ducts, for those people who are also fans of How I Met Your Mother know that up to four people can share a toothbrush. The Barnacle: I'm sorry, I don't care about about the rules set by HIMYM, sharing a tooth brush is just gross. I'll splurge the $3 or if they're going electric, I'll buy Sarah a separate head. She's worth it, man. Quiet Pool: I don't see anything wrong with sharing a toothbrush. These two are swapping enough spit to make this a legal move. Run it over some hot water after each use and you are good to go. Speaking of air conditioning ducts, your favorite movie involving crawling through ducts? Dr. Toboggan: Biodome - Bet you didn't see that coming, but there is nothing like watching Pauly Shore and Stephen Baldwin crawl through air ducts in search of junk food. The Barnacle: As much as I want to give it to Die Hard for being the first movie I can remember involving them, I'm going straight out of left field and giving it to Toy Story 2 for realism. Clearly ducts could only support the weight of plastic toys and never full grown men. Quiet Pool: I'm going farce on you guys. Top Secret! Nothing like old school Val Kilmer making fun of other movies that have used air duct scenes. Ignore those pesky Chuck spoilers and tell us, will/should Sarah say yes to Chuck's accidental proposal? Dr. Toboggan: We know Chuck too well. He will explain to Sarah what happened and she will half believe him, but poor Chuck will now have marriage on his mind. From cheating a little and seeing the Chuck coming attractions, I am guessing this will lead to a horrible, but hilarious plan from Morgan and Chuck. The Barnacle: Obviously no. She's holding out for me. And baby, unlike Chuck and his second hand ring, you're getting a full karat of cubic ziconia from me! Quiet Pool: Should she? Of course. He's her Chuck. Will she? I wouldn't assume so. It seem a little early for that storyline. Do I want her to? Absolutely. Let's throw another huge wedding bash for these kids! Sarah: We don't have the authority to interrogate Chandler. Chuck: Well we don't have the authority to use the supply closet for what it is we use it for, but we do it anyway. Don't we? You're acting awful bitchie Burton, or whatever it is you go by. Permalink: You're acting awful bitchie Burton, or whatever it is you go by. Chuck Review: "Chuck Versus the Cubic Z"